A world without coffee is not a world most people would want to live in. Storing coffee beans for the long haul will ensure your favorite morning beverage needs are met and you will have enough extra for the neighbors and family during an emergency. A world without coffee is not a world most people would want to live in. It makes sense, then, that figuring out how to properly store your coffee should be high on your list for your emergency food supply. After all, a steaming hot cup of Joe is a great moral booster while you are sitting out an emergency. Like everything else, a little planning goes a long way; there are a few things to consider when prepping coffee beans for long-term storage. Pre-roasted coffee beans are readily available almost everywhere—from coffee shops to grocery stores to gas stations, and they can easily be purchased online as well. They are more affordable when purchased in bulk and easy to grind for your personal use immediately. Like most foods that you want to store for a long period of time, you need to remove them from their sale packaging and keep your beans in airtight containers away from light, air, and moisture. It’s important to remember though, that pre-roasted coffee beans immediately begin losing their freshness upon roasting. Even in airtight containers or mylar storage bags (see the proper techniques for food storage here) roasted beans will only last around 6 weeks in storage. If using pre-roasted beans is important to you, you’ll need to replenish/rotate your storage every few weeks. To me this seems like a hassle, because I’d rather have a bulk quantity ready to go for the long haul. The solution is storing green coffee beans and roasting them on your own when you’re ready to use them, but many people shy away from roasting their own beans (though they shouldn’t, as I’ll explain below). Purchasing green coffee beans is far cheaper than purchasing roasted coffee beans. To compare, a 25-pound bag goes for around $105 dollars—that’s close to the price of a 12-pound bag of roasted beans! 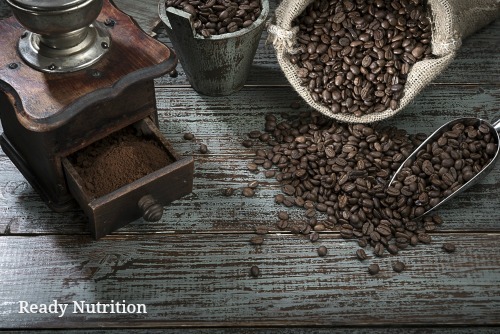 Besides, green coffee beans maintain freshness for several years (you might want to rotate your supply after 2 years just to be on the safe side). But how do you go about roasting your own beans? Do you need a bunch of fancy equipment and a barista’s knowledge of coffee? Not at all–a cheap popcorn popper or a frying pan and you’ll be good to go. In a catastrophic situation where electricity is unavailable, all you need to remember are the tenants of the above videos: use a soft, indirect heat, keep the beans moving, and don’t let them roast for too long.